We drove or walked passed them regularly when we were younger, the buildings that were part and parcel of our everyday life in Adelaide until the 60s and 70s. Then they were suddenly gone, demolished to make way for a new structure or development. One enterprising photographer decided to capture some of the old buildings on film before they disappeared. Frank Hall visited sites where demolition was about to take place, photographed the buildings and is now sharing some of the images from his collection. My thanks to Elaine Hall, Frank’s wife, for posting these wonderful photos on Adelaide Remember When. The Bowman Building on King William Street near Currie Street, had numerous shops and offices and a fine arcade which included a gent’s hairdresser, tobacconist, Malboro Aviaries for all bird and fish needs, Corset House, experts in fitting correct support for women, S D Kerr Umbrella Dealers and the Musical Box, which I recall was a record shop owned by Kym Bonython. The building was erected by Keith Bowman in the early 20th century, was five-storeys and described as “an early example of reinforced concrete in multi-storey architecture”. I’m not sure when it was demolished, possibly in the early 70s. Before the Hilton Hotel was built. Some of the small shops that were on the site where the Hilton now stands in Victoria Square. Pre-Hilton Hotel days in Victoria Square. This photo shows the buildings that stood where the Hilton Hotel is now situated, with Godfreys, a snack bar and deli, Murrays Dry Cleaners, Bradley Frocks and Victoria Cafe. To the left of the photo would be Moore’s on the Square and where the phone boxes are in this photo is now the walkway into the little Central Market Arcade and the escalators up to the Central Market Carpark. And Godfreys would be the southern side of the Hilton. The Pirie Street Methodist Church, demolished in 1972. The Pirie Street Methodist Church, located behind the Adelaide Town Hall, was the ‘cathedral church’ of Methodism in Adelaide. It was built in 1850, it could seat 800 downstairs, and an additional 400 in the galleries. In 1969 Pirie Street Methodist congregation merged with nearby Stow Congregational Church, an early step in what was to become the Uniting Church. In 1972 the church was closed and demolished to make way for the Colonel Light Centre. What are your memories of these buildings which stood for many years in Adelaide city? Radio Days, When Wireless Was King. So sad to see that most of Adelaide’s lovely, fine,well known old buildings have (it seems) almost all been demolished! In the name of “progress” or “vibrancy” (sic). Thankfully there are still a lot of photographic “memories” around. Here’s hoping that our State Library or the Archives will accept any of the many fine collections of old Adelaide buildings, & not say they cannot take them, for whatever reason. ( ok if you knew the shop numbers )it was not easy, but as I got used to it I believe I made a good job of it and I was asked to work for CPS when they started doing there own deliveries, , but there system left a lot to be desired and I went on to other things,, I believe that they might have been a charity , I know they had a lot of shops .All history now of course , I hope you found this interesting, Peter. I remember the Head Office above the CPS in Franklin Street. My Mum was the Tea Lady and cooked meals for the Manager “Mr Whitehead”…. The annual Staff Picnics were fun too! Good memories from my childhood. 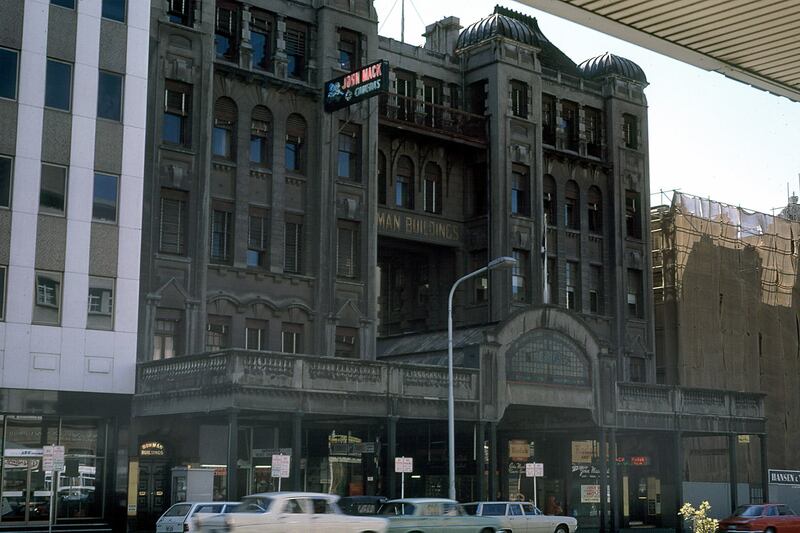 It is great to find this site, I love adelaide especially all the memories, Does anyone recall when there was a billiard hall on part of the second floor of city cross, Florences restaurant was just below on the ground floor, Does anyone recall the time when Rundle St became a mall? The Bowman Buildings were demolished after 1976 because I bought a Polaroid 250 camera in the building at John Mack’s in that year and snapped test photos inside and outside the shop. My mother worked in the Arcade, she worked in a snack bar that was named “Caspers”. I was school and often I would drop into Caspers during school holidays. I loved exploring the building, I remember the old stairs to the basement. When the building closed mothers employer moved her business next to the Pancake kitchen it was called “The Omelet Pan”.